I saw Narnia on opening night and really enjoyed it. I had kept my expectations low because I certainly didn’t think it would be possible to have a beaver that talks and doesn’t look cheesy. Not to mention some dozens of other talking animals. Yet, somehow they pulled it off — the beavers were very realistic. Whoever wrote the screenplay deserves an award. The dialog was very, very good. I have seen so many movies where the dialog felt unnatural. I think films with young actors fall into the trap of poor dialog combined with poor acting far too often. This movie does not. In fact, I was impressed with the actors who played the 4 Pevensie children. They really knew their characters and the dialog fit perfectly. To give you an example about the dialog. I think the reaction on meeting Mr. Beaver was very good, and the reaction upon meeting Mr. Tumnus was excellent. It made for a film that works realistically even with talking animals. This film could have been an hour longer. It was very fast paced. I found things moving almost too quickly. Winter moves to summer fast: One minute they’re on frozen ice and the next they’re on a plain with green grass and sunshine. Perhaps in the book that happens as well, its been years since I read it. I thought the wolves were very realistic and I thought it was impressive how the White Witch creates disappointing moments for her captors. That was very dynamic. If you’ve seen the 1988 television version you’ll see a lot of similarities. For the television movie they eventually made The Silver Chair and Prince Caspian and the Voyage of the Dawn Treader (IMdb). Both were quite good for their time and I hope they remake those as well. Mild spoilers follow? Only if you havn’t read the books. I thought it was good too. Except the waterfall scene, that was a bit silly. Also, the girls do a lot more fighting in the book from what I remember. As my gf said, that is probably the hardest bit to get over; in the book it’s easy to imagine these kids fighting. But seeing it on screen, those minotaurs would squish them! It’d be good if they make more. Edmund is of course a complete snot in this film, but he’s pretty cool in the later books. Yeah, that waterfall was a bit unbelievable. Good comments. I agree about the book vs film. Little kids against giant beasts just doesn’t work out too well. I thought the story was a little bit rushed (granted how many little kids can sit througha movie more than 2.5 hours? ), so it was hard to get into the characters. And, I hated the choice of Liam Neeson as Aslan. However, Tilda Swinton = best villian EVAR. The movie was AWESOME, but I thought Aslan’s scenes were a tad rushed and Tilda Swinton needs a new hairstylist/costume designer. Her costumes and dreads were just…. WEIRD. But that’s just me. She was definitely very very evil, so she did good with that. Kudos to Georgie Henley who played Lucy–she was amazing! Yeah, Aslan wasn’t the best pick for a voice. I agree. I’m hoping for a “director’s cut” that shows Aslan actually bleeding when he gets stabbed, and maybe the witch’s head getting chewed off. I thought some of the creatures were far more scary than a little realistic blood would have been, for kids. I thought the dreadlocks and black contacts were very witchy. I just saw the movie this afternoon with my wife and our homeschooled daughter. It was a field trip surprise for her book report on the book itself. As a Christian, I liked the book better (C.S.Lewis fan, anyway). The movie seemed a bit dulled down. I could see, however, that in some parts the script may have needed to be changed a bit. But, one of my most favorite parts of the book (being that we have a “particular stance” on Santa Clause) was when Lewis had Father Christmas actually say, “Long live the true King” as he sledded off. In the movie, he simply stated, “long live Aslan.” A bit disappointing, but not a huge deal. The movie, though altered from its book (as SO many movies tend to do, anyhow), was still rich in biblical parallels and was an awesome learning tool for my daughter to relate to Jesus Christ’s sacrificial death and His rising from His death into Glory. I, too, rate this high on the B.E.A.V.E.R. system: 4.5! Ben: All I can say is that you’re the only person that will probably ask for that version of the Director’s cut. And since when has the directors cut been for sale? Didn’t that used to be JUST for the director?? So now we have: Original film, extended edition, special release, never before seen shots, a directors cut, and then a real directors cut. All this cutting must be expensive. Brian (The Hubby): Did you ever see the 1988 film? In that one “Santa” is referred to as Father Christmas. Obviously in this 2005 rendition they refered to him as Santa Clause. Oh well. Now I really can’t wait for King Kong. Doing that up Saturday afternoon (I think) in case anyone wants to go. I have never read or known anything about Narnia in original version. So, in my following comments everything is just religiously neutral. I have watched it recently in the form of film and this is my opinion about what i feel about the show. Great and fantastic Promotion and Preview,but emptiness within…………..
too much as a fairy tale ,…..
characteristic of each main character not properly shown……their full abilty not properly put foward. The ending is also dissatisfactory, the film just ends with some kind of uncertainty not properly explained. There is also some kind of hanging in between the film. It just does not have the kind of smoothness i will normally feel and experience when i am watching a so-called good film. From starting to end the story is some kind of emptiness, for kids it is ok for the nice pictures, for adults some kind of boring. 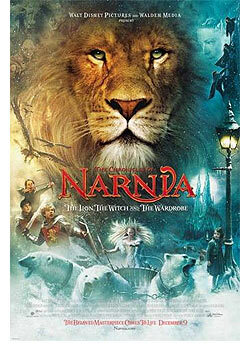 I am a huge narnia freak and I am dying to know what is the next narnia movie going to come out? Is it Prince Caspian or is it The Magician’s Nephew?? Or are you guys even doing another movie? Thank you soo much.